These pink saddle shoes and I had some good times. Unfortunately, I ending up having to send them back. After only wearing them a few times, they ending up breaking. I'm super into Bass shoes and their characteristically amazing quality, but the shiny cover on these Bass Loves Rachel Antonoffs ending up splitting after only a few wears. You can't see the damage here, but the top cover, supposedly not meant to bend with a foot, split open. 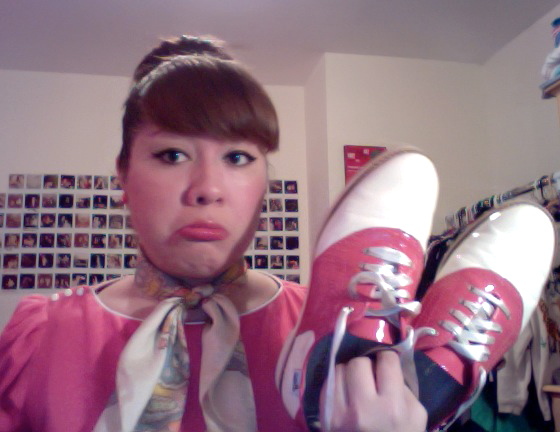 I'm super bummed that I no longer own pink saddle shoes. If anybody knows where to get some...please let me know! I'm still coveting a million other Bass Loves Rachel Antonoff shoes, but am wary to buy them. I think it's just the Odette style that is troublesome though so I've decided to move on to a new pair...the wonderfully red Wendybirds!